Well, this was a twisted little tale. Based off of my experience with similar books, I expected Mike to be your standard sociopath, but I didn’t really feel he was. He has some obvious mental health issues and while he did lack empathy for most people and situations, he didn’t lack ALL empathy. I mostly just felt bad for his poor, delusional life. However, I was pretty much on his side the whole time and I don’t even feel uncomfortable saying that. I did not care for Verity at all. Never getting her POV, I’m not really sure how much of what she said was true. I think Mike read way too much into what she said and assigned meaning to her words that weren’t true, but she was still not a good person. I thought she was purposefully cruel where Mike just took all of his cues from her and didn’t seem to know better. I also thought for how well she knew him, she had to have known how some of her actions would seem to him. I kind of spent the whole book waiting for her to go down. I felt like this book was much longer than it needed to be. Dude, we get it. You love V and you want to be with her and you’re playing an elaborate game. It just went around and around like that for far too long. Additionally, instead of traditional chapters, the story was told in three very large parts and I think that contributed to making it feel long. I did enjoy Part 3 of the book much more than the first two parts, though. 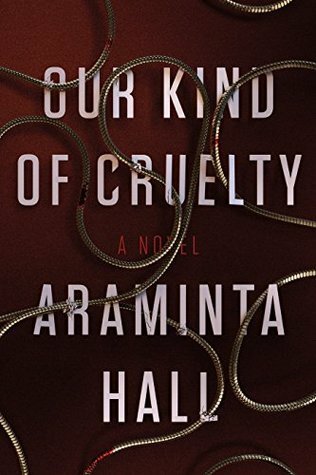 Overall, I enjoyed reading Our Kind of Cruelty, but I didn’t love it. I thought it went on a little too long and did not find the story quite as compelling as similar books. However, I did really like the final part of the story and I liked Mike. This book wouldn’t be for everyone, but there is definitely a niche audience for it that will love it. I don’t care for those books that circle around, on and on. I skipped this one after reading several reviews. Just didn’t think it would be a favorite (your review has confirmed my initial feeling). Glad it was OK though!! Glad I could help confirm your decision! I mostly enjoyed it, but it would definitely not be for everyone. Thank you! The court case was definitely the most interesting part of the story. I don’t feel guilty at all for liking Mike haha. Sounds like maybe a bit of extra editing could have helped this one. Great and very insightful review Stephanie! Thanks! I agree, some extra editing would have been a great benefit. WOW! That blurb! It made me want to read this, but I’m not sure now since you didn’t love it. A thriller has to be amazing for me to switch from romance to read it. Great review! Thanks! I am not sure if you would like this one? Maybe if you are in the mood to try something a little different it might be worth checking out. Had a hard time getting into this one. I appreciate your honest review! I’ve been following you for ever so I didn’t understand why today was showing that. That button can be so touchy. Hopefully now it will stay on “following“. I can definitely see it hard getting into it. I actually started it one other time before now and I only got a few pages in that time before I knew I definitely wasn’t in the mood for it. I didn’t check my grammar before posting. That should’ve said I have been following you forever and I don’t understand why it wasn’t showing that today… lol. Great honest review! This sounds very interesting and I love that cover. I’m sorry you didn’t loved it but I’m glad you at-least you enjoyed the final part of the story. Thank you! I did enjoy moments of it, even if it wasn’t as good as I was hoping.